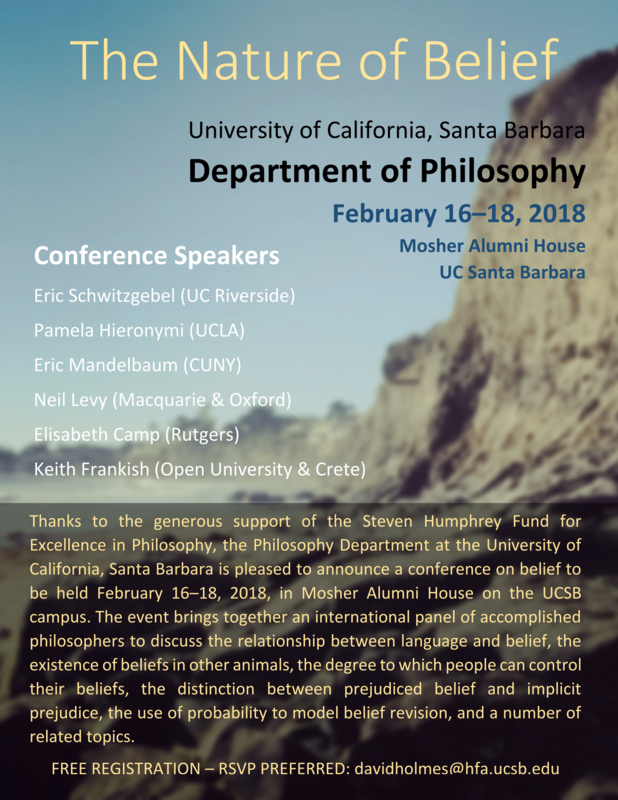 The UCSB Philosophy Department is pleased to announce a conference on the nature of belief to be held February 16-18, 2018 in Mosher Alumni House. Confirmed speakers include David Velleman (NYU), Eric Schwitzgebel (UC Riverside), Pamela Hieronymi (UCLA), Eric Mandelbaum (CUNY), Neil Levy (Macquarie and Oxford), Elisabeth Camp (Rutgers), and Keith Frankish (Open University & Crete). The conference is made possible with the generous support from Steven Humphrey Fund for Excellence in Philosophy.